Singapore is not just a modern city with skyscrapers and shopping malls, and Stomper Ben Lee can prove it to you. An Estuarine crocodile was captured devouring a white migratory bird in a Sungei Buloh reserve on Saturday (Jan 5). Ben, who is the founder of nature conservation organisation Nature Trekker, captured vivid pictures of the incident at about 6.03pm that day. He told Stomp: "The weather was unfriendly over the past few weekends due to dark clouds and heavy rainfall. "Last Saturday, the weather was fine, so I took the opportunity to venture into the nature reserve with my wildlife photography gear and equipment." He said he was passing by a river in the reserve when he heard splashes and noticed some ripples on the surface of the water. He recounted the incident and said: "I saw a large leathery creature moving in the water with something whitish in its mouth." It suddenly dawned on him that this was a rare Estuarine crocodile, also known as a saltwater crocodile, devouring a migratory little egret. Ben felt excited and honoured to be able to spot such a scene. 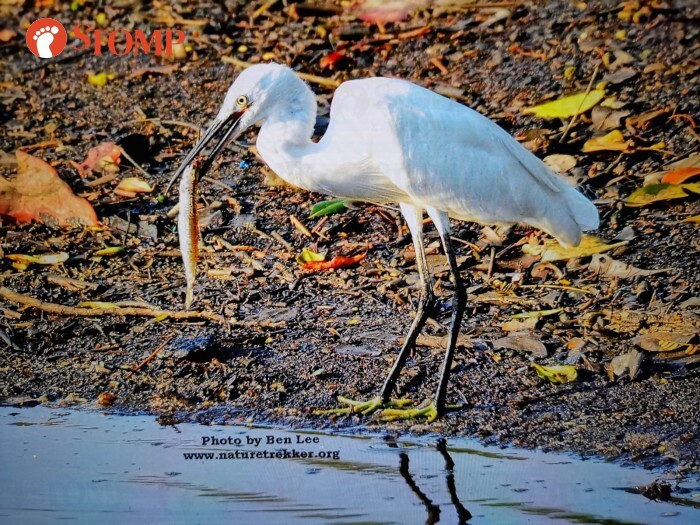 According to Ben, the egret was clamped tight in the crocodile's jaw and drowned in the water. When the bird became lifeless, the crocodile then ate it. "It was truly a sight to behold for all nature and wildlife photographers," he added. In the pictures Ben took of the crocodile feasting, the white feathers jutting out of the crocodile's mouth were those of the egret. 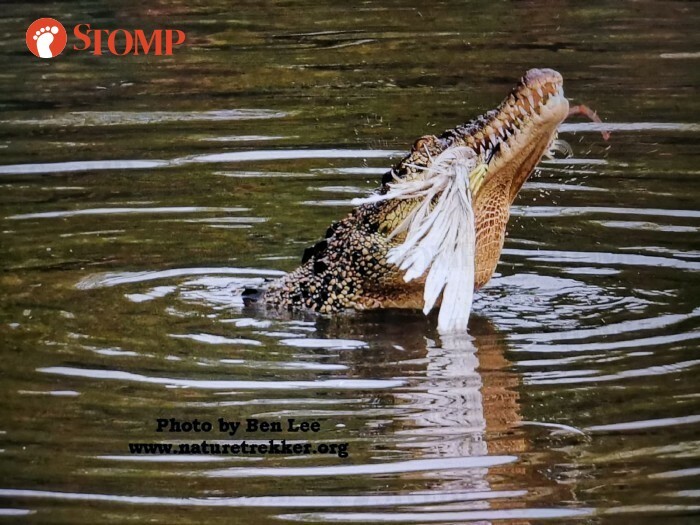 According to Ben and the Wild Singapore website, Estuarine crocodiles are listed to be 'Critically Endangered' in the Red List of threatened animals in Singapore. They are hunted for their skin which is used to make leather goods such as shoes and handbags. Their meat is also hunted for consumption. View more pictures of the crocodile in the gallery.